Beaulieu Motor Museum started life as a collection of just a few leaky vintage cars in the entrance hall of the beautiful Palace House. Today it’s known country-wide as a major attraction with its distinctive (if slightly Heath Robinson) green monorail, Cistercian Abbey and home to more than 250 of the most famous (and valuable) cars ever known, including Donald Campbell’s Bluebird, James Bond’s submersible Lotus Esprit S1 and Alain Prost’s McLaren F1. Beaulieu is one of the few New Forest attractions that I can think of that has something to appeal to every one of a family of New Forest Tourists. Within the museum grounds can be found (apart from the motor museum itself) the ruins of a 13th Century Abbey, its palatial gatehouse (aptly named Palace House), a playground complete with little electric go-karts, extensive Victorian walled gardens, a World War II SOE museum, an elevated 2-station monorail, a café, vast grassy picnic areas and riverside walks. 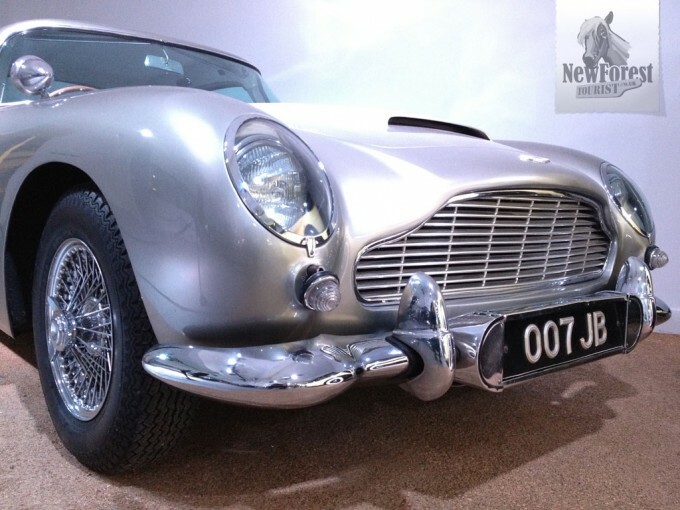 The additional installations like Top Gear’s Enormadrome, 50 Years of Bond and Movie Cars exhibitions only serve to sweeten the deal. The remarkable building that houses Lord Montagu’s collection of cars hasn’t changed at all since I first visited decades ago. It wears its age very well, and the unmistakable aroma of engine oil, grease and machinery permeates the building like a comforting blanket. With our ‘Friend of Beaulieu’ family membership (which pays for itself within about three visits) we fall back on the museum regularly as a weekend retreat. The kids always like to tick the monorail (their ‘green train’), the Wheels ride (‘red train’) and the playground off their list before we do anything else. 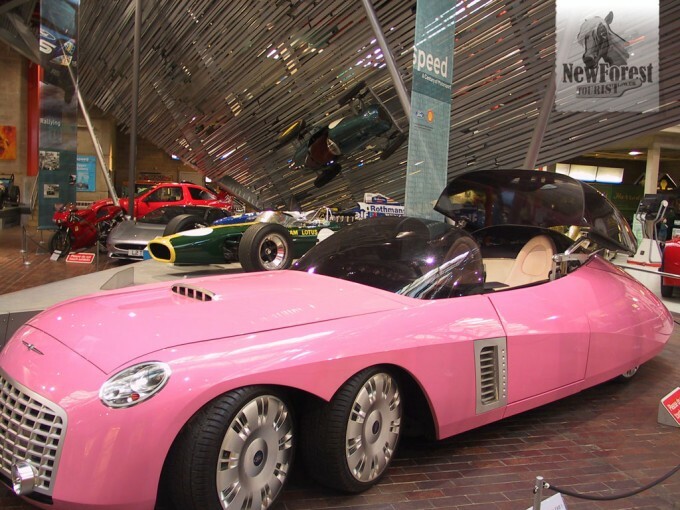 The museum building itself contains a plethora of cars, both vintage and modern, and a number of side installations like the 1930s garage that have been beautifully put together. I wouldn’t exactly describe myself as a ‘petrol head’, but I do love to wander through the maze of walkways, coveting the Ford GT and E-Type Jag and smirking at Chitty Chitty Bang Bang up on the plinth. 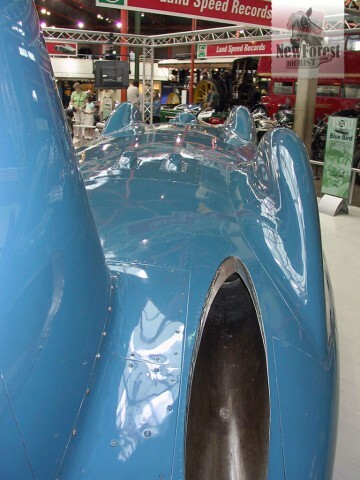 A central area features the land speed record cars, the most famous of which is Bluebird, Malcolm Campbell’s monstrous marvel. The absence of the Thrust jet-powered cars is made up for by their miniature replicas in the land-speed record holders display. They’d be too big anyway… There are a few motorbikes upstairs (when the James Bond cars aren’t in town), but the car is definitely the star here. The amusingly 1980s Wheels ride has also changed very little over the years, and for me this is part of the attraction. It wasn’t until relatively recently that the looping video of people wearing shoulder pads and rah-rah skirts with Flock of Seagulls haircuts getting onto the ride was removed. I missed it. The only other alteration that I can think of taking place was the removal from one of the final displays of what could only be described as a miniature corpse reading a map. Just as well – it was starting to scare the kids. Here and there you’ll also find the occasional video game, and now and then a go-kart simulator complete with hydraulically moving cage with is great fun. It’s inevitable that the wife and kids will tire of this gigantic garage before long though, so it’s off to Palace House. There are about four different ways to get down to the gorgeous Palace House with its comforting open fires, staff in period dress, paintings, antiques and room full of dead birds. One way is to take the monorail (the green train as the kids know it). An elevated platform is a stone’s throw from our destination. The monorail is another quintessentially British (ex-Butlins) quirk that appears in pretty much evert advert I’ve ever seen of the National Motor Museum. I like to think that it’s one of the last legal ways you can take your life into your own hands in England. Made of moulded fibreglass, I marvel at how it manages not to disintegrate like an old egg box every time I manoeuvre my not-inconsiderable bulk into it. Good thing too – although I’m also convinced that one day I’ll fall off one of the platforms. But that’s just me. If you fancy a much older (and equally rickety) mode of transport down to the house, climb aboard the Edwardian London bus for a creaky drive past the ruins of the 12th Century Cistercian Abbey on the left. 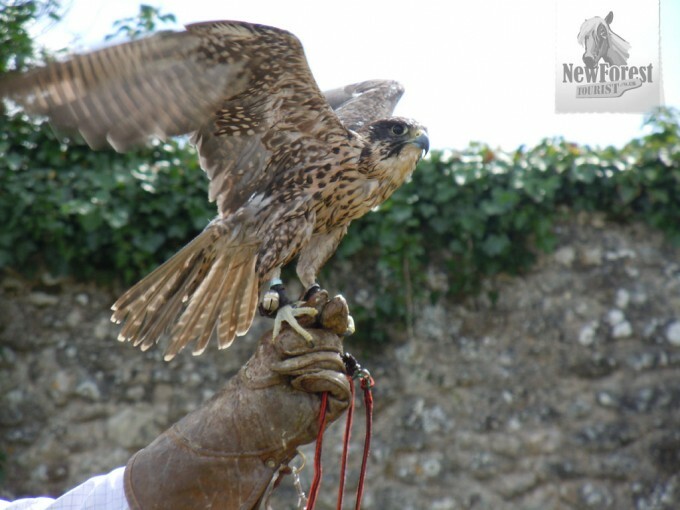 In the summer you might see a talented and experienced falconer showing off the skills of his birds of prey as they fly over the heads of the seated crowd, their talons literally combing the hair of the captivated audience. I prefer the top deck of the bus – it makes me feel like a rebel and it’s open-topped which means that conversation isn’t drowned out by the deafening creaking sound of the wooden chamber enclosing the first floor compartment. The bus stops next to an ice cream kiosk (handy!) and Palace House is a short walk away. 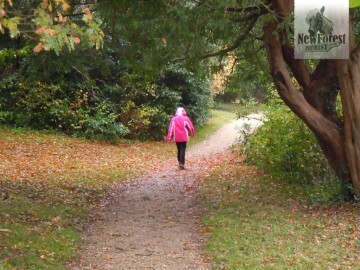 If walking is your preference there are a couple of routes. Straight down the middle takes you through the Victorian walled gardens, although you’ll need to duck between the tall hedges that line the path in order to see it. 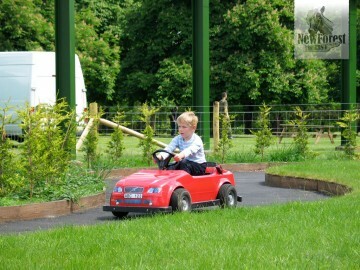 On the way is the playground with a height limit (favouring the short over the tall). 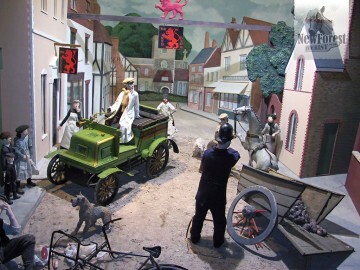 Here the kids will find a miniature of the Edwardian bus complete with slide as well as numerous other distractions. 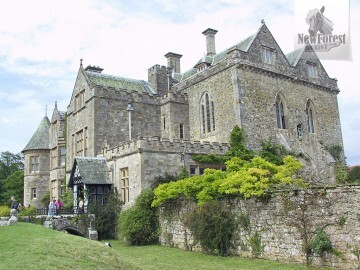 Continuing all the way down to the WW2 SOE museum and turning left will deposit you onto the gravel drive in front of the ancestral home of Lord Montagu, Palace House. If you fancy a woodland walk instead, turn right at the entrance (under the monorail track) and you’ll find a peaceful riverside walk taking you all the way there. On the right Beaulieu Village comes into view and you realise how unfair it is that you don’t live here. Then you walk into Palace House and pretend that you do. Without wishing to attempt a narrated guided tour through the house, I will leave you to wander the cavernous rooms, the dramatic staircase and game-lined corridors. I’ll only mention my favourite things about Palace House. The staff throw themselves into their roles to make the atmosphere enchanting. 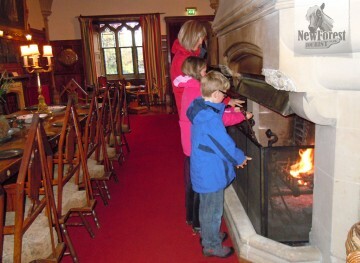 At Christmas they’ll hand you mulled wine as you come in and sing carols around the piano with you. Upstairs they entertain the children with fancy dress and antique toys while I wander off to find the wood panelling rescued from the House of Commons, the hidden staircase and my favourite painting of the Montagu children painted by local artist, Jason Sullivan. At Easter the kids carry out a search of the house for artefacts in order to claim their easter egg and in the summer… well in the summer I find it a little hot so I collapse on the front lawn and stare up at the medieval towers. Lovely. For those with an interest in more recent history, the SOE Museum is a tiny revelation; a little shed filled with secret cameras, inventive weapons and sad tales of brave secret agents who did battle for their country behind the scenes. SOE (Special Operations Executive) agents were trained on the Beaulieu Estate and this museum is a memorial to them. There’s also a little about the war effort in other areas, such as the construction of the massive sections of the astonishing Mulberry Harbour on the Beaulieu River, and the local WW2 airfields which can still be visited today. 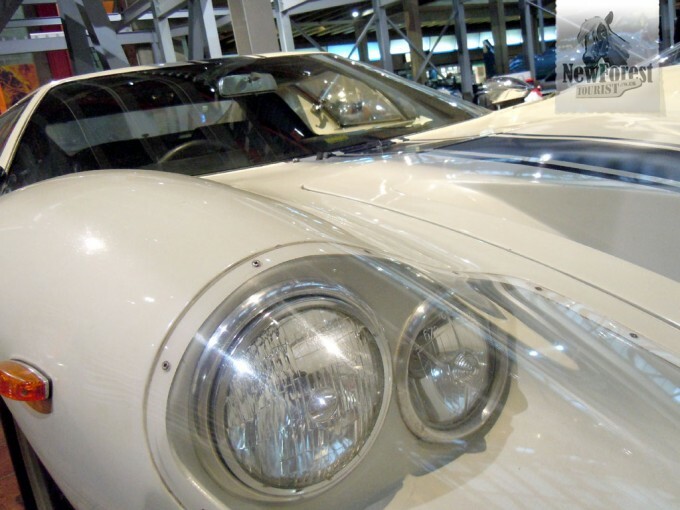 Another great reason to become a ‘Friend’ of the National Motor Museum Trust is that the cost of membership also includes entrance to the major events that go on throughout the year, such as the Beaulieu Boat Jumble, Beaulieu Auto Jumble, Trucks & Troops, Firework events and so on. For the occasional visitor though, a one-off visit is good value as long as you take the time to see everything on your visit. 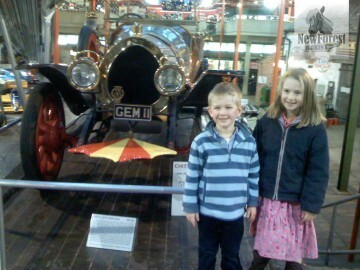 Up to this point I’ve been rambling on about how great the National Motor Museum is. And it is… except for one thing. I simply cannot in good conscience recommend the Brabazon Restaurant. The loos are fine – but I can’t ever remember feeding myself or my family there and not come away feeling a little cheated… part of the motoring experience I suppose. To expand on this opinion, I’ve eaten there a number of times and always felt that the food is overpriced and of a pretty poor standard. So bring a picnic and be happy!